For customers in Des Peres that require a fast solution for sewer line complications such as backups or flooding, call Nu Flow St. Louis for your repair needs. With affordable prices and excellent solutions, our technicians will assist you in eliminating the foul odors permeating your home or reversing the water damage in the walls. We pride ourselves on offering solutions that are guaranteed to both satisfy our customers and offer long-lasting results that will eliminate concerns of future repairs and replacements. With Nu Flow St. Louis, we get the job done right the first time with our effective sewer repair methods. Whether your home is newly built or over twenty years old, all sewer pipelines are susceptible to damage and require maintenance and care. Our sewer repairs are accurate and effective not only because of the advanced technology we use to install them, but because our methods are complemented with a sewer camera inspection before and after the repair is complete. Prior to any repairs, we send a camera into your pipes, capturing footage of the inner walls of your pipes and analyzing the feed in search of clogs, cracks, leaks, corrosion, and other problems of concern. Once the inspection is complete and the diagnosis is given, our technicians explore the ideal solution with our customers. Fortunately, we offer solutions of both repair and replacement for our customers, ensuring that they have the final decision in the process. With our sewer repairs, we rely on highly sophisticated equipment, materials, and procedures instead of large holes and trenches to fix your pipes. Our procedure doesn’t require the complete exposure of the pipes either; instead, a machine installs a tube into the sewer pipes through a small access point. The tube is comprised of an inflatable bladder and a felt outer surface that is saturated in a specially formulated wet epoxy substance. 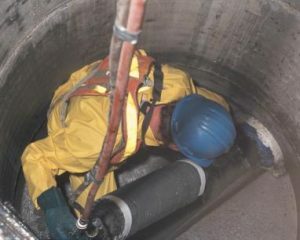 Once the tube is inflated, the wet epoxy substance coats the interior surface areas of the sewer pipeline, completely covering seals and cracks as necessary. The tube is then deflated and removed from the sewer pipes, and the epoxy resin is left to cure and harden along the pipe walls for a few hours. After the process is complete, the resin has created a brand new, powerful pipe within the old one, and by sealing away cracks and areas of corrosion, the new pipe ensures that similar problems won’t reappear in the future. The completion time of our sewer repairs is a single day, costing far less than the traditional method of repairs by being cheaper to install and taking less time to complete. After the repairs are finished, a final sewer camera inspection is conducted in order to test the quality of the installation and ensure that it was correctly done. Our new epoxy-based pipes are designed to have a lifespan of at least fifty years or more, guaranteeing efficiency and solidifying it as a worthy investment. If you sewer pipelines need to be repaired, don’t wait to get assistance. Call Nu Flow St. Louis to restore your pipes and resolve the problem quickly.